Writers of history come in two varieties: those who fashion history by making it, and those who describe the process later. Here, as is so often the case, metaphor clothes the spirit or higher sense, while the literal sense serves only to fix the particulars. In this, we maintain, lies the key not only to the meaningful interpretation of traditional epic histories, but also to the faithful rendition of raw events into popular history. For historiography -- the telling of history -- is also in a sense the source of history itself. Guiding principles operate at all times. It is well known to historians, common people, and physicists alike that one and the same event may validly conform to radically different descriptions or explanations, e.g. a 'particle' may also be viewed as a wave. Descriptions, conforming to different perspectives, may serve different purposes more or less effectively. Seen as microcosmic examples of macrocosmic principles, even 'ordinary' incidents acquire epic grandeur, and find a place in the heart and mind of ordinary people. Exhibiting levels of meaning that go deeper than the literal or 'factual' alone, truly epic accounts not only relate traditional histories, but touch the hearts of millions as well, thereby becoming a part of the historical process itself: the dialects of history. Clothed in language, a product of the human mind, history reflects the invisible patterns of thought and language, for which modern linguists have invented the concept of a 'deep structure' underlying the surface patterns. It is prudent for historians and others to avail themselves of advances made in related fields, however obscure the connection might at first appear. Bereft of higher – or – deeper – principles, history remains a pseudo- science, battleground for contending ideologies, and a fertile source of hatred and violence. Resting upon universal principles, unaffected by passing fashions in thought, epic accounts weave people and events together in a unity transcending particular interests. Insular Śrī Lanka, long home to a veritable rainbow of cultures, is a unique microcosm representing all of Asia in its crosscurrents of east and west, tradition and modernity. As such, Sri Lanka may serve historians admirably as a looking glass of Asian history, ancient and modern. However for the historian whose perspective, assumptions, and methods are essentially foreign to a traditional culture, the long history of Sri Lanka remains a sealed book. Modern history let us remember, is a modern invention, whereas human intelligence is not. Every culture gives a full account of itself, one that is true to the conditions and ideals of that culture, whether it conforms to European notions of history, or not. All too often, these moving accounts, records of great antiquity in their own rights, are dismissed by western-trained scholars as the fantasies of simple-minded people and as gross distortions of 'the facts'. There is certain arrogance in a mentality that allocates truth to itself and superstition only to others: more, perhaps, than European thinkers would generally care to admit. It has had a souring effect upon East-West relations from the tine of the very first European imperialists right up to the present day. This deep-seated bias may be seen to have an ill defined but pervasive influence upon every aspect of relations between East and West, from the purely material sphere of trade, finance, and military affairs to the common intellectual sphere fashions are supposed to count for nothing. Even the writing of history has not escaped distortion. This subtle - and often not so subtle - antagonism on the part of what may be called the modern mentality towards the normal or traditional mentality goes back a long way, and has assumed many guises over the centuries. But it is everywhere marked by an instinctive faith in material solutions to problems of whatever sort, and a corresponding implicit denial of the principles, which are the support of the phenomena they so cherish and worship. The net result is a striking predisposition to quantify human affairs, as witnessed by the preponderant role that money and brute force play in the modern scheme of things. When a culture's own account of itself, oral or written, is not accorded its full and rightful place in that people's history as told to them by historians, then one may justifiably surmise that this 'history' contains motives foreign to the culture it presumes to describe. What is more, it may be deduced that only the literal or inferior elements of the indigenous account have been accessible to the historian, all the rest escaping his attention. A mentality dedicated to quantitative solutions cannot even aspire to the faithful interpretation of the factual – symbolic accounts of cultures still operating according to qualitative principles. Since only in the orient does the traditional view still hold out against the uninvited incursions of the modern mentality, it is legitimate to speak of distinction of east from west, as of tradition from modernity. There is no greater challenge in history then this titanic struggle of mentalities. …Here from remote ages was worshipped the six headed twelve-armed Kanda Kumaraya, otherwise Mahasena Divyaraja, Adhipati (Lord) of the Ruhunu Rata, the hero-god…Kataragama, say the Hindus, is his favorite adobe; in this age – the Kali Yuga – his authority extends over the entire world. What Kataragama represents to millions of Sri Lankans is already well documented by social scientists and others. It is sufficient to remark that, from prehistoric times, Kataragama has commanded the utmost respect – even approaching fear – across lines of race and religion, such that even Christians, not to mention Muslims, Buddhists, and Hindus, routinely visit remote Kataragama in large numbers. Their rites of vow fulfillment by the deity, which one may see performed en masse at festival times, stand as mute testimony to Kataragama's silent influence. This power that Kataragama exerts over the imagination of so many has been adequately explained, but patterns do exits at a number of levels, suggesting that Kataragama represents more than just a fabulously successful jungle shrine. For the legend of Kataragama is primarily and throughout a symbolic story which adapts itself to a remarkably broad range of interpretations. Not only may Kataragama be described faithfully in mythological or purely symbolic terms, provided that one adheres to the body of symbolic correspondences. Reduced to its basics framework, the Kataragama story centers around the repeated descent and exploits on earth of the solar hero: his battles with the forces of darkness; eventual triumph in the name of truth; his love for the terrestrial princes – the human soul – and dalliance with her on earth; and final consumption in a sacrificial act that fulfills his vow to return once again, as in principio. Upon this symbolic framework may be woven any number of thematic variations, each depending upon the particular perspective taken. Thus, for example, the Kataragama hero is variously described as the first Ancestor of humanity, the servant – or even the son – of god, bodhisattva or Buddha to be, an eternal youth, or general of the divine forces in their battle against the satanic forces of darkness. One of Kataragama's unique features is that multifaceted story is not only related at the time of annual Esala festival, but performed as well on a majestic scale. This magnificent performance, as we have endeavored to establish in an earlier paper (unpublished), represents an initiatic tradition of mystery plays, one which has gracefully accommodated social change since well before the Common Era. Amidst the ravages of time, Kataragama preserve its timeless message. Clearly, what is suggested is not a sort of historical relativism elevated into a general theory, for relativism would imply a reciprocity, which is singularly absent in the present context. Rather, it has from the beginning been an unequal struggle in which, broadly speaking, the west has brought to bear against the east the full force of what has been called its "proselytizing fury", all for its own purely pragmatic purposes. Nowhere has the Western or modern mentality had to undergo the degree of change that it has sought to impose upon traditional cultures everywhere. The time for redress is opportune. Historically, Kataragama has always maintained a low profile. While this may strike some as a rationalization fir the near-absence of Kataragama from history books, it should also be borne in mind that, in principle, the hero or god-king of Kataragama is one who achieves his aim through subterfuge, disguise, and stratagem. To wit, he is a god of wits, humanly accessible to those who apprehend his modus operandi. This should tell something about where he is to be found, and how. Historical suggestions of the Kataragama myth appear in the Sri Lankan history as early as the late centuries of the pre-common Era, leaving little room for doubt about Kataragama's antiquity which, according to oral tradition still preserved in Kataragama, predates the appearance of either Sinhalese or Tamil culture in Sri Lanka. The most notable historical example from this period is the epic struggle between two popular Sri Lankan kings, Elara and Dutugemunu. Modern historians, and Sinhalese chauvinists in their turn, have sought to emphasize the ethnic dimension of this episode, portraying it as the patriotic struggle of Sinhalese nationalists to expel or exterminate the Tamil inhabitants. In doing so, they have performed a great disservice to Sri Lanka; but that is not the point here. Criticism has been leveled against these same people for conveniently overlooking the fact that king Elara, whether he was a Tamil speaker or not, was also one of Sri Lanka's most respected monarch's, serving a reign of forty-four years that was noted for its impartial justice and patronage of various faiths, including Buddhism. In fact, it was Elara's unswerving dedication to justice that settled his end, for he found himself duty-bound to order the execution of his own son and their heir-apparent, who had recklessly caused the death of a cow, a capital offense in those days. Unable to abdicate without a successor, Elara's utmost concern at his age would have been not to maintain himself on the throne at any price, but to heal this disruption in the natural order by allowing for a just and natural succession, at the cost of his own life. Considered in this context, the events that followed acquire added significance. In Ruhunu, young prince Duttugemunu vowed to Kataragama to fight for the justice and the cultural integrity of Sri Lanka. Symbolically, this act set in motion the epic events that were to follow. Duttugemunu was then able to raise a large army and march successfully, battle lance in hand, against the petty chieftains who stood between him and Elara. by the time Young prince and the old king faced each other on the field of battle, the overtones of their symbolic encounter would have been fully evident to both of them, if not to others as well. Duttugemunu had to come out victorious, just as Elara would have welcomed this opportunity to end his life in battle. Never was the outcome in doubt, as far as they were concerned. In a sense, Elara's sacrifice was Dutugemunu's triumph, and together they restored the ancient symbolic order in a spectacle that was as mysterious as it was dramatic. Undoubtedly, the whole affair left a deep impressions upon Duttugemunu, not to mention Sri Lankan consciousness ever since. Out of gratitude to Kataragama, and in fulfillment of his vow, Duttugemunu decreed that hence forth and in perpetuity a vast grant of populated and rich land in Ruhunu would be given over to the sovereign authority of god Kataragama himself. Further, to insure that the traditional rites would also be carried forth on behalf of all posterity, he stipulated that they be partitioned into 505 ritual assignments, or roles, to be annually performed in accordance with the tradition of 'royal service', or rajakariya, and passed on from one generation to another in property. Time, encroaching jungles, and successive governments have cheated Dutugemunu's intentions, but through an ingenuous redundancy of tasks, the overall performance still survives today, even if scaled down by centuries of attrition, misunderstanding, and official neglect. In a sense, the king-less kingdom of Kataragama is yet extant, alive in the hearts of his subjects. What can be more low-profiled than that? To understanding the interplay of abstract concepts and the unfolding of history, it is essential that grasp the role of what is called Mahasammata, or 'common agreement'. Because it was common to all, it was the called maha, 'great'. The agreement, or a sammata, was not a public scheme or policy, but the articulation of the common interest: it was the 'common sense' of those days. Truly effective policy, or what our contemporaries call 'power', was understood to devolve from higher principles, or Dharma. The analogue in the human domain was the king – or sometimes queen – whose authority to reign depended upon adherence to dharma. Principles reigned, rather than individual interests, so unanimity of opinion was natural. 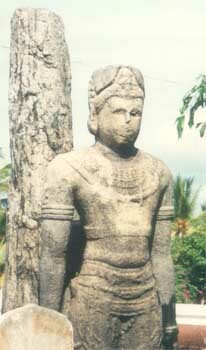 One example of this mahasammata in Sri Lankan history is as follows. The island largely consists of what has been called a hydraulic culture, where seasonal rains must be supplemented by irrigation to assure adequate crops of rice. Large-scale irrigation requires the construction and maintenance of wewas, bunds for the purpose of gathering the seasonal rains for distribution as needed. These enormous irrigation works, many if which are still functional today, were built and maintained through the institution of rajakariya, whereby each household agreed implicitly to give manual service to the king in return for an allotment of life-giving water. The reign most famous for the creation of these great bunds was that of King Mahasena, whom historians assign to the third century C.E. It is noteworthy that this king should bear the name Mahasena (literally, 'who has a great army'), as it is not for military exploits that he is remembered. Rather, Mahasena was a king whose inspired leadership served not only to insure the nourishment of his people, but to help forge their sense of common identity as well. In other words, the 'great army' he raised consisted of every man, woman and child in the kingdom, armed with a common consensus. Whatever Mahasena's personal peculiarities, he remained the living symbol of his people's Mahasammata. This is close association of King Mahasena with the concepts of Rajakariya and Mahasammata is crucial to a genuine understanding of the traditional perspective: Rajakariya was Mahasammata in practice, the performance of which embodied timeless principles. The earlier reliable description from western sources of Sri Lanka, or Taprobane as it was then called, comes down to us from Ptolemy of Alexandria, famous astronomer and geographer of the second century C.E. Ptolemy is credited with such a remarkable extent and accuracy of information about Taprobane that, in one historian's words, "it has given rise to surmises as to the sources whence it could possibly been derived." Ptolemy's description of Taprobane "proves that the island had been thoroughly circumnavigated and examined by the mariners who were his informants." That Kataragama is nowhere directly mentioned by Ptolemy is no indication that he was unaware of its existence and character. As an initiate into the traditional mysteries of the Mediterranean world, Ptolemy would have not only clearly recognized the signs of a mystery performance elsewhere, but out if respect for its sanctity would have refrained from making any direct mention of the place, cf. 'Sacred is secret'. However, in keeping with the universal character of initiatic knowledge, he would have left ample hints or clues which would pass unnoticed and uncomprehended except by observers similarly acquainted with initiatic lore. If Ptolemy was riddling, then the traces of his riddle might be expected to survive in his records for posterity. Indeed, many have been puzzled by at least one feature of Ptolemy's map of Taprobane, which unaccountably labels the then heavily populated Ruhunu area adjacent to Kataragama as "the elephants' feeding grounds". However, when one considers this anomaly in the context of Kataragama's close association in myth with elephants – for Kataragama is also Gajaragama, 'the home of the elephants'- Ptolemy's apparent error begins to make sense. Here 'elephant may also be understood to bear reference to the elephant's reputation as the wisest and gentlest member of the jungle family. 'Feeding grounds' imply sanctuary and available nourishment- but for whom? Ruhunu may have also protected its four –footed elephants, but un metaphorical terms reference is understand to the itinerant 'elephants' of society, the homeless custodian of tradition. 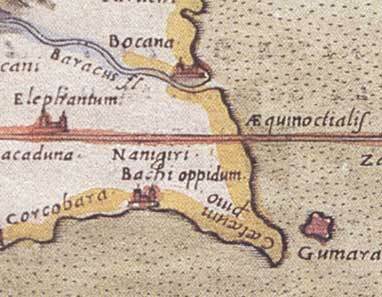 Even more revealing is Ptolemy's curious naming of the ocean waters just off Kataragama as the 'Sea of Dionysus'. Astute observers, like Bharati (1973), have already surmised that the god of Kataragama is a Dionysian deity. Ptolemy, who was certainly well-informed about the worship of Dionysus, would not have employed hid name randomly, as certain of our contemporaries are inclined to believe. Geography, for Ptolemy as well as for traditional people s everywhere, also entailed an element of higher or initiatic knowledge. Most pointed out all of Ptolemy's oblique references to Kataragama, however, is his naming of a large rocky proturbence into the sea of Dionysus as the dionysii promontorium, or promontory of Dionysus. Here again, what the promontorium 'stands for' (pro-) is the mount of Dionysus, i.e., Kataragama peak, which in all likelihood was the center of Kataragama's worshiping those days. Thus, Ptolemy's intended reference was to something higher than the physical phenomenon he named. This may appear to some as a digression from the discussion of historiography and the sources of history. But it does serve to highlight the difference between histories traditional and modern. For the former, possibilities of meaning of a higher or metaphorical order are not merely entertained as another order of reality, but as the principle or determining factor in the story of humanity, whether considered in sensible or symbolic terms. For the later, histories of a modern or western perspective, the import or message is felt to abide in the literal sense alone, disqualifying every possible interpretation of an order higher than that which can be gleaned from a systematization of facts into 'theories of history'. European colonial powers were incessantly at war with each other and every culture they contacted. With the landing of European forces in Ceylon in the sixteenth century, this contrast of east and west began to play itself out in dramatic fashion. As the most unabashed of western conquers, the Portuguese had come to the east for the professed intention of saving the souls of the heathen and relieving them of excess wealth. These early European imperialists kept hearing stories of Kataragama's fabulous wealth, and by the mid-seventeenth century could contain their greed and avarice no longer. 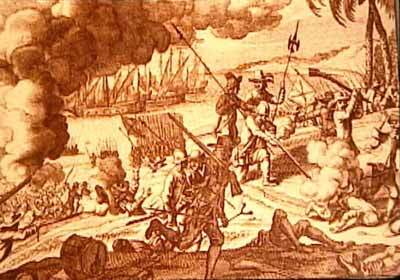 What has prevented them in part for so long from satisfying their curiosity were disturbing reports that Kataragama maintained a standing army of 500 men for its defense. When we came near the spot where they said the pagoda stood, we took a native resident close to that spot and our commander inquired from him if he knew where the pagoda was. He replied that he did, and that it was close by; he acted as our guide and led us through a hill covered with forest which was the only one in the district, and this we wandered round re-crossed many times. it was certain that the pagoda was at the top of it but I do not know what magic it possessed for out of the five guides whom we took, the first three were put to death because we thought that they were deceiving us, for they acted as if they were mad and spoke all kinds of nonsense, each one in his turn without the one knowing of the others. The last two deceived us and did exactly the same, and we were forced to turn back without even seeing the pagoda which is called catergao. Captain Roberio may be excused for not realizing it, but his oversized looking party had fallen victim to the very kind of puzzling embarrassment that is Kataragama's hallmark. The fabulous wealth they coveted was fabulous indeed, but still it proved to be enough to fire their ingrained cupidity. For the god of Kataragama, a center of riddles and mysteries, is described in myth and legend as being not only the divine strategician Skanda, but also the eternal divine child, kumara, who is forever engaged in mysterious pranks and games like hide and seek. The spirit of Kataragama was well known and alive in the heart of every inhabitant of that region. It was this 'standing army', represented as the 505 symbolic rajakariya tasks, that the literal-minded European imperialists, and modern historians in their wake, so totally failed to find. As to what the 'nonsense' was that all five native 'guides' provided to the invaders, we shall probably never know what it was. 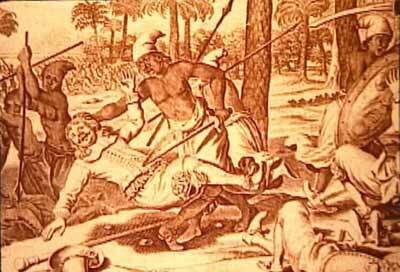 But, somehow or other, the Europeans and their allies had been tricked by the myth that is Kataragama. By the early nineteenth century, the Kandyan Kingdom had been under stage by hostile European powers for three hundred years, and was ready to topple. In 1814, with a view to obtaining help in replacing an unpopular monarch, the Kandyan nobility invited the intervention of British forces. The predictable result, that the English refused to leave and undertook to subvert – with the very best of intentions – every major Kandyan tradition, was soon to prove unbearable to nobility and common people alike. Most irksome of all, from the indigenous standpoint, was the eradication of the institution of kingship along with the king himself. As one contemporary Sri Lankans than a mere wielder of state power, but "as amply illustrated by the elaborate ritual and ceremonial that surrounded his person, was the sacred symbol that was believed to hold society together. "Or in even more graphic terms, as John Davy was to write in 1821. "They say that a king is so essential that without him there would be no order nor harmony, only confusion and dissension that would soon prove fatal to society". In other words, within a few short years the citizenry was cast into a mood of general oppression, anxiety, and a creeping fear that Sri Lanka, Dhamma Deepa, had entered the long slide onto conflict act and chaos. Caught in the grip of their own convictions, the English were unable to see that they were setting the stage for eventual counter-actions. They did not have long to wait. The Kandyan population, long accustomed to freedom in the matters that meant the most to it, lacked only the leadership to undertake a war of independence. They did not have long to wait, either. A fresh lesson in history – Kataragama-style – was about to unfold. Apart from the fact that the rebellion ended in apparent failure – for the outcome was never military in doubt – the plot that unfolded contained all the elements of a classic Kataragama performance, whether one chooses to disregard the metaphorical dimension, or not. To begin with, the Great Rebellion of 1817-18 was neither planned nor expected by anyone living in Ceylon at the time, and took the Kandyan nobility as well as the British by complete surprise, a typical feature of the Kataragama legend. Exactly what happened is difficult, if it is not impossible, to determine all its subtleties. What is known is that one Vilbave, ex-bhikkhu and unreformed rogue from the low country, suddenly appeared in Kataragama at the conclusion of the great festival in July, 1817, and announced that he had been chosen by the god of Kataragama to be King of Ceylon. Again, we are reminded that, not only is the Kataragama of legend a god of ploy who acts through surrogates or by default altogether, but the site of Kataragama is also an ancient stage for the enactment of mysteries that nobody has claimed to comprehend. Dare we presume that there was no more to it than what met the eye? Modern historians have done just that. That such a tale-teller and underhanded character as the mythical hero of Kataragama should appear in the guise of a mendicant rogue claiming royal lineage – saying he was Doraisami, Nayakkar prince of the deposed royal family – also comes as no surprise whatsoever to connoisseurs, for Kataragama, they tell us, is the original pretender, partitioning himself out to all for the sheer joy of it all while showing himself nowhere. Pilling subterfuge upon subterfuge and surfacing in the most unlikely of roles, the creative process at work in Kataragama proves time and again that truth has many faces. To make a long story short, rump king Doraisami, alias Vilbave, acquired in no time a great following and set off toward the Kandyan hill country, awarding grandiose appointments along the way even before his coronation ceremony several months later at Wellawaya. The combination of melodrama and slapstick is familiar enough to students of Kataragama. Needless to say, however, it has never found its way in to history books. On the initiative of Vilbave, or whoever he was, the people of Uva Province – old Ruhunu – rose in revolt against the British occupation force in September 1817. The timing of it all, in a sense the very distinguishing mark of Kataragama, could hardly have been worse, at least from the European standpoint. Not only was it the beginning of the rainy season, when communication and supplies were hampered by swollen rivers, but the Great Rebellion came at a time when British forces in Ceylon were depleted and native auxiliaries in short supply. 'King' Vilbave could not have planned it this way, and could not have planned it better, either. True to the principles of Kataragama, is just happened to turn out that way, to the embarrassment of the English this time. As long as the apparently inept pretender Vilbave was at the head of operations, things went ill for the British, and rebellion spread like wildfire. But coincidentally, as soon as the influential chief of Uva found out about Vilbave's shady background and began to loose steam. Without a common consensus at the top, rivalries and suspicion broke out among the nobility and soon everyone sensed that the rebellion would and soon in failure. Symbolic confirmation came in 1828 with the 'accidental' recovery by the British of the sacred tooth relic, which had been spirited away early by sympathetic Buddhist monks. The end was not far off: Vilbave soon faded into history, and the long slide into the modernity that Kandyan loathed was ready to begin earnest. Vilbave entered history as "the first of series of pretenders" whose deeds "set a pattern for future pretenders". In view of insight such as this, it is remarkable that historians have not devoted greater attention to the pattern under discussion, which may be called the 'deep structure' of Kataragama. The connection between the unfolding of history and the grand enactment of principles into myth is something that has never been properly understood. Kataragama is good place to start. Before we had possession of the country, kataragam (sic) was greatly frequented. The number of pilgrims is now annually diminishing, and the buildings are going to decay. In a very few years, probably they will be level with the ground, and the traveler such, we must hope will be their fate, and the fate of every building consecrated to superstition of this very degrading and mischievous kind. Co-opting the ancient tradition of rajakariya into a system of unpaid forced labor to construct the roads that their military and commercial interests required, and approaching enormous tracts of village common lands to hand over to speculators later, the British did everything they could to dismantle the indigenous culture and replace it with something more acceptable to them. The fact that modern histories paint the British period as one of enlightenment and national resurgence only further suggests that history-writing itself was serving as the hand-maiden of European interests and perspectives. In the context of what has been discussed thus fat, it is most revealing to note that the worship of Kataragama in recent times has burgeoned in popularity to a remarkable extent, co-extensive with the period since 1948 of independent nationhood. It need hardly be added that the name period has been marked by a steady erosion of the social fiber of Sri Lankan society. New historical theories are being invented all the time to explain the course events have taken and to suggest what might follow. Indeed, as many would readily agree, there is a certain pattern to events, but it seems to defy all attempts at systematization in theory. The principal reason for this unsatisfactory state of affairs, we suggest, is the one-sided approach that sees importance only in consideration of the sort that matter to western-influenced historians, namely the expressions of forces pertaining to the lowest order of reality, the quantitative realm, denying to themselves the insights that maintained traditional civilizations in a state of homeostasis or balance in the midst of relentless change, historians must take upon themselves the responsibility for the conflict and confusion that has for so long characterized their field. No one is suggesting that a return is possible to a simpler age, or that conflict is entirely avoidable. But it is entirely possible that historians could perform a great service to Sri Lanka, if not to humanity at large, by conceding that there are also other ways of reading and writing history than the so-called modern approaches. The lessons of Kataragama serve as a useful starting point for those having the humility and breadth of vision that such for those having the humility and breadth of vision that such an endeavor requires. Just how high the stakes may by is difficult to ascertain, but it should be self-evident by now that, as the expression goes: Time is short, and the work is vast. B. Pfaffenberger. "The Kataragama Pilgrimage: Hindu-Buddhist interaction and its significance in Sri Lanka's Polytechnic social system", Journal of Asian Studies, vol. xxxviii, No. 2, 1979, p. 266. J.E. Tennent. Ceylon: an account of the island, London, 1859, p. 537. A. Bharati "Serendipity Suddenly Armed", Quest, No. 80, Jan-Feb 1973, p. 41. P.E. Pieris. Riberio's History of Ceilao, Colombo, 1909, p. 174. Malagoda. "Millennialism in relation to Buddhism". Comparative Studies in Society and History, XII (IV), p.434, cited in K.M. de Silva. History of Ceylon, vol. III, Colombo, 1973, p. 28. J. Davy. An Account of the Interior of Ceylon and of its Inhabitants, London, 1821, p. 140.
de Silva, op.cit., p. 29.